Hydrogels, due to their unique potentials such as high-water content and hydrophilicity are interest for the controlled release of drug molecules. The present study aims to create a controlled-release system through the preparation and characterization of hydrogels based on pH-sensitive polymers such as poly (acrylic acid). 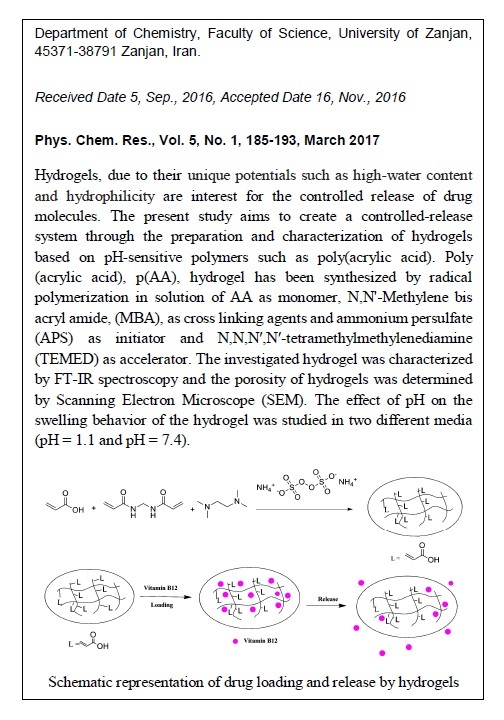 Poly (acrylic acid), p(AA), hydrogel has been synthesized by radical polymerization in solution of AA as monomer, N,N'-Methylene bis acryl amide, (MBA), as cross linking agents and ammonium persulfate (APS) as initiator and N,N,Nʹ,Nʹ-tetramethylmethylenediamine (TEMED) as accelerator. The investigated hydrogel was characterized by FT-IR spectroscopy and the porosity of hydrogels was determined by Scanning Electron Microscope (SEM). 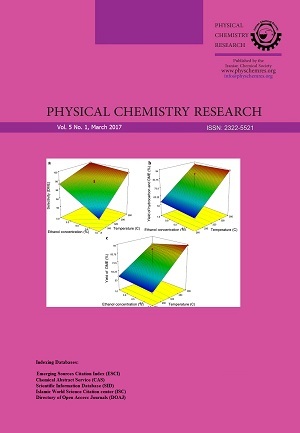 The effect of pH on the swelling behavior of the hydrogel was studied in two different media (pH=1.1 and pH=7.4). The release percent of vitamin B12 has been investigated by UV-vis spectrophotometer. In addition, release of B12 was investigated in the presence of folic acid (B9). In same pH, in the presence of different amount of folic acid (B9), results showed that the samples involving the low release of vitamin B12 were arranged as follows: folic acid (25%) > folic acid (50%) > folic acid (75%).